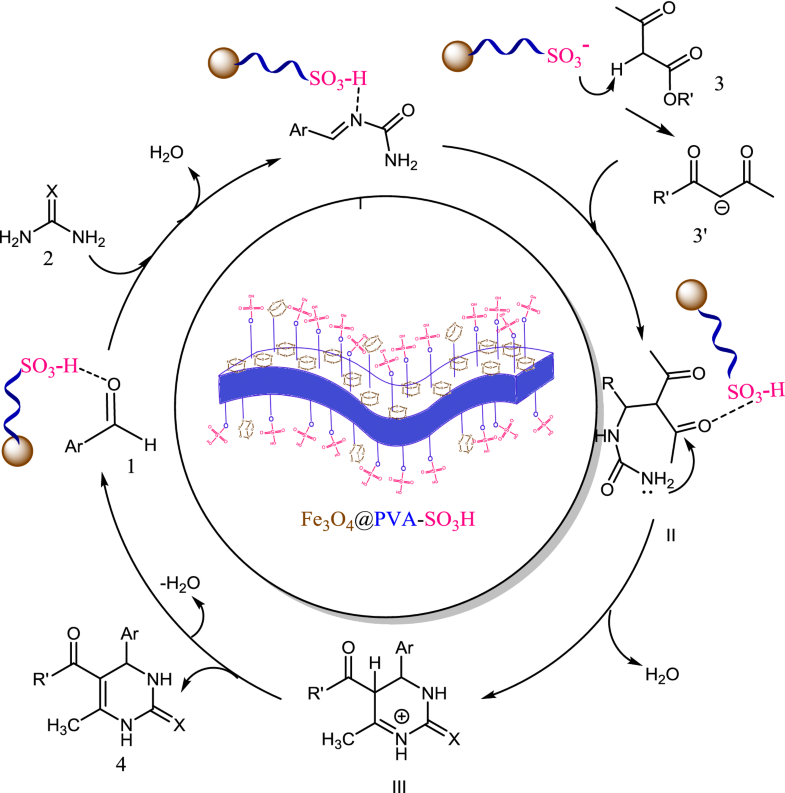 For the first time, the design and preparation of magnetic polyvinyl alcohol (Fe3O4@PVA) nanocomposite film as a novel nanocatalyst was accomplished by in situ precipitation method. To enhance the catalysis activity, the surface modification of this nanocomposite was carried out by sulfonic acid. After the synthesis of this nanocomposite film, Fourier-transform infrared (FT-IR) spectroscopy, energy-dispersive X-ray (EDX) analysis, field-emission scanning electron microscopy (FE-SEM), transmission electron microscopy (TEM) images, X-ray diffraction (XRD) pattern, N2 adsorption–desorption by Brunauer–Emmett–Teller (BET), thermogravimetric analysis (TGA) and vibrating sample magnetometer (VSM) were utilized to confirm the structure of the nanocomposite. The catalytic activity of Fe3O4@PVA was investigated by the synthesis of dihydropyrimidine derivatives from an aldehyde, ß-ketoester and urea or thiourea. This heterogeneous nanocatalyst can be easily separated by an external magnet and reused for several times without any significant loss of activity. Simple work-up, mild reaction conditions and easily recoverable catalyst are the advantageous of this nanocomposite film. Recently, magnetic nanoparticles (MNPs) have raised awareness due to their potential application in catalytic activity [1, 2]. They have the advantage of both homogenous and heterogeneous catalyst including high reactivity, high dispersion and easy separation. These benefits are owning to their nanoscale size and magnetic properties [3–5]. Among all MNPs, Fe3O4 nanoparticles have received considerable amounts of researchers’ interests due to their low cost, majestic reactivity and high specific surface area which can be easily and rapidly isolated from the reaction mixture by using an external magnet . Nowadays, the immobilization of biocompatible polymer onto magnetic nanoparticles have been highly taken into consideration by organic chemists [7–10]. Polyvinyl alcohol (PVA), a water-soluble synthetic biocompatible polymer has received great attentions due to its high hydrophilicity high density of –OH groups, low toxicity, low cost and high chemical resistance . PVA was prepared from polyvinyl ester and has been applied widely in biomedical and industrial applications . The large amount of OH groups and hydrophilicity nature of PVA are the major drawbacks of this synthetic polymer reducing its application. The main reason of this incident is dissolving in water. 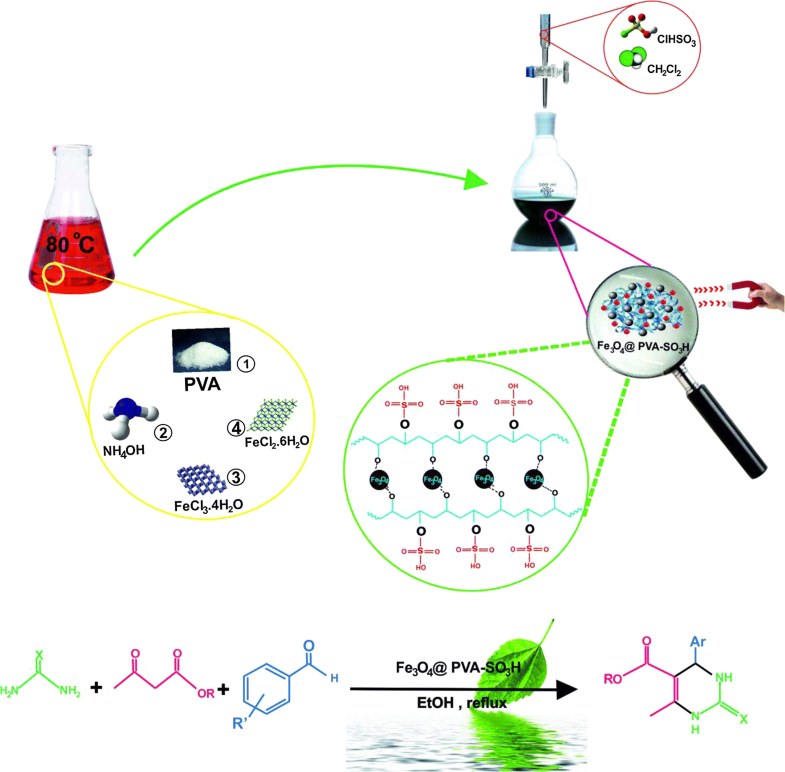 Noteworthy, hydrophilicity of PVA can be reduced via functionalizing OH groups . Moreover, mechanical properties and water resistance can be improved by modifying PVA with chemical or physical cross-linkers. There are several reports about functionalizing OH with various groups such as acidic functional groups that can solve the hydrophilicity problem . Over the past years, several methods have been announced for the synthesis Fe3O4/PVA nanocomposites such as electrospinning technique , ex situ  and in situ methods . This synthesized nanocomposite has been utilized in various fields such as drug delivery as membranes for bone regeneration and other biomedical application [17, 18]. Proceeding our research on green nanocatalysts as well as multicomponent reaction (MCRs) [19–22] are considered as an important organic synthesis strategy. MCRs are one-pot reactions in which more than two reactants produce a single product that includes whole atoms of starting materials [23, 24]. Recently, MCRs have received a lot of attentions for producing various biologically active compounds. Dihydropyrimidinone (DHPM) derivatives are the most important class of heterocyclic compounds which have attracted lots of researcher’s attention due to their biochemical and pharmacological properties . For the first time in 1891, Biginelli announced an useful reaction for the synthesis of DHPMs . Because of the biological effects of DHPMs such as antiviral, antitumor, antibacterial and anti-inflammatory activities, several methods have been reported for synthesis of these compounds containing β-dicarbonyl compound, aldehyde and urea or thiourea in the presence of various catalysts such as Bronsted acid , Lewis acid , heteropolyacid  and Fe3O4 nanoparticles . Most of these catalysts have several drawbacks such as tedious workup, toxic metals, low yields, long reaction time, environmental pollution and difficult separation. In the recent years, attempting to improve the catalyst in this reaction has received a lot of attention. Herein, we report for the first time the synthesis and characterization of Fe3O4@PVA-SO3H nanocomposite film and investigate the catalytic application of this nanocomposite film synthesis of dihydropyrimidine (DHPM) derivatives. The solvents, chemicals, and reagents applied in our experiment were entirely purchased from Merck, Sigma and Aldrich. Melting points were measured on an Electrothermal 9100 apparatus and fourier transforms infrared spectroscopy (FT-IR) spectra were recorded through the method of KBr pellet on a Shimadzu IR-470 spectrometer. Adds that, 1H and 13C Nuclear Magnetic Resonance (NMR) spectra were done on a Bruker DRX-500 Avance spectrometer at 500 and 125 MHz, respectively. Scanning electron micrograph (SEM) images were also taken via Sigma-Zeiss microscope along with attached camera and transmission electron microscopy (TEM) was provided on a Philips CM200. To go through the details, magnetic measurements of the solid samples were performed using Lakeshore 7407 and Meghnatis Kavir Kashan Co., Iran vibrating sample magnetometers (VSMs). Elemental analysis of the nanocatalyst was carried out by energy-dispersive X-ray (EDX) analysis recorded Numerix DXP-X10P. 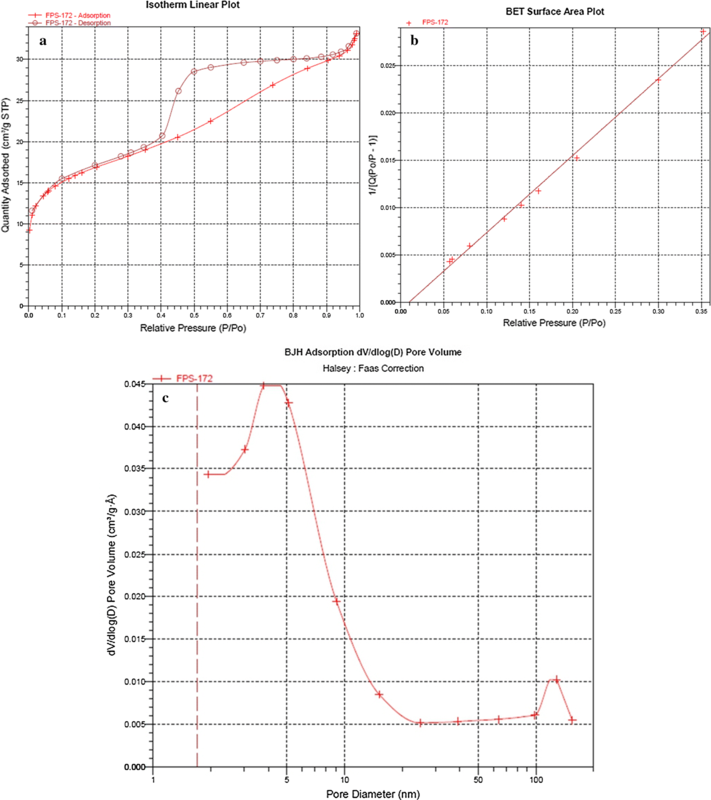 XRD patterns of the solid powders were carried out using a JEOL JDX–8030 (30 kV, 20 mA). Nitrogen adsorption and desorption isotherms were determined using Micromeritics ASAP 2020 apparatus using nitrogen the analysis gas at − 196 °C. The specific surface areas were calculated by the BET method, and the pore size distributions were calculated from an adsorption branch of the isotherm by the BJH model. At final, we should add that the products were identified through the comparison between the spectroscopic/analytical data and those come from authentic samples. To synthesize the Fe3O4@PVA nanocomposite film excellently, co-precipitation may consider the best approach. At first, a homogenous mixture resulted from 2.0 g of PVA 72,000 Mw constantly dissolved in 40 mL water (for 3 h at 80 °C). After that, under nitrogen (N2) atmosphere, homogenous PVA was mixed with 12 mL of NH3.H2O in a three-necked flask. Next step, 2.5 g of FeCl3·6H2O and 1.0 g of FeCl2·4H2O were dissolved in 10 mL of deionized water and the mixture was added slowly to the NH3-PVA solution. Then, in order to precipitate the Fe3O4@PVA, the mixture was heated for 120 min at 60 °C and washed with deionized water. At final, when the pH was hopefully reached to 7, the precipitation was dried at 80 °C in an oven. In the beginning, 0.5 g of Fe3O4@PVA in 20 mL CH2Cl2 was added to a suction flask equipped with a constant-pressure dropping funnel and a gas inlet tube which is conducting HCl gas over an adsorbing solution (i.e., water). While it dispersed by an ultrasonic bath for 30 min, a solution of chlorosulfonic acid (0.25 mL) in CH2Cl2 (5 mL) was supplemented dropwise at -10 °C. After that, in order to fetch up HCl totally, the mixture was at least stirred for 90 min. The consequence was hopefully a powder of nano-Fe3O4@PVA-SO3H was filtered and washed several times with dry CH2Cl2, methanol, and distilled water. The finalized nanocomposite was dried under vacuum at 70 °C. 0.05 g of Fe3O4@PVA-SO3H magnetic nanocatalyst was added into a solution consists of 1.50 mmol of an aromatic aldehyde, 1.50 mmol of a ß–ketoester, and 2.00 mmol of urea or thiourea. The mixture was timely refluxed in EtOH and the completion of the reaction was carefully monitored by thin layer chromatography (TLC). As a result, the catalyst was easily separated by an external magnet and the products were purely obtained from the recrystallization of the hot EtOH without more purification. Finally, we characterize some products through the FT-IR and some others via matching their melting points (Table 3) on literature samples. 1H NMR (500 MHz, CDCl3): δH (ppm) = 1.08 (3H, t, J = 7.1 Hz, CH3), 2.17 (3H, s, CH3), 3.93 (2H, q, J = 7.1 Hz, CH2), 6.11 (1H, d, J = 3.4 Hz, CH), 7.15–7.33 (5H, m, H–Ar), 7.74 (1H, s, NH), 9.19 (1H, s, NH); 13C NMR (125 MHz, CDCl3): δC (ppm) = 14.0, 15.9, 52.5, 60.7, 105.0, 121.5, 123.6, 127.5, 132.0, 132.5, 135.5, 140.6, 146.6, 160.6. 1H NMR (500 MHz, CDCl3): δH (ppm) = 1.06–1.09 (3H, t, J = 7 Hz, CH3), 2.21 (3H, s, CH3), 3.93–3.97 (2H, q, J = 6.5 Hz, CH2), 5.01 (1H, s, CH), 6.65–6.67 (2H, d, J = 8.5 Hz, H–Ar), 6.99–7.01 (2H, d, J = 8.5 Hz, H–Ar), 7.62 (1H, s, OH), 9.11 (1H, s, NH), 9.13 (1H, s, NH); 13C NMR (125 MHz, CDCl3): δC (ppm) = 14.5, 18.2, 53.8, 59.5, 100.0, 115.4, 127.8, 135.8, 148.2, 152.6, 156.9, 165.8. 1H NMR (500 MHz, CDCl3): δH (ppm) = 1.05 (3H, CH3), 2.22 (3H, s, CH3), 3.94 (2H, q, CH2), 5.12 (1H, s, CH), 7.16 (2H, H–Ar), 7.22 (2H, H–Ar), 7.75 (1H, s, NH), 9.23 (1H, s, NH); 13C NMR (125 MHz, CDCl3): δC (ppm) = 14.5, 18.2, 53.7, 59.6, 99.5, 115.5, 115.6, 128.7, 141.5, 149.0, 152.4, 160.7, 162.7, 165.6. 1H NMR (500 MHz, CDCl3): δH (ppm) = 1.07–1.123 (3H, t, J = 11.5 Hz, CH3), 3.45 (3H, s, CH3), 3.95–4.00 (2H, q, J = 11.5 Hz, CH2), 5.05 (1H, s, CH), 6.65–6.69 (2H, d, J = 8.5 Hz, H–Ar), 7.55–7. 153 (2H, d, J = 8.5 Hz, H–Ar), 9.45 (1H, s, NH), 9.11 (1H, s, NH), 9.13 (1H, s, OH). 1H NMR (500 MHz, DMSO): δH (ppm) = 2.21 (3H, s, CH3), 3.49 (3H, s, CH3), 5.10 (1H, d, J = 3.3 Hz, CH), 7.18–7.29 (5H, m, H–Ar), 7.72 (1H, s, NH), 9.18 (1H, s, NH); 13C NMR (125 MHz, CDCl3); δC (ppm) = 18.7, 51.3, 55.6, 101.2, 126.6, 128.1, 128.9, 143.7, 146.9, 153.9, 166.3. 1H NMR (500 MHz, CDCl3): δH (ppm) = 2.31 (3H, s, CH3), 3.59 (3H, s, CH3), 5.26 (1H, d, J = 3.5 Hz, CH), 7.26 (4H, m, H–Ar), 7.51 (1H, s, NH), 9.11 (1H, s, NH); 13C NMR (125 MHz, CDCl3); δC (ppm) = 18.7, 52.6, 57.7, 98.9, 121.2, 123.6, 127.5, 135.0, 142.6, 146.6, 152.6. 1H NMR (500 MHz, CDCl3): δH (ppm) = 2.22 (3H, s, CH3), 3.52 (3H, s, CH3), 5.04 (1H, s, CH), 6.59–6.65 (3H, m, H–Ar), 7.03 (1H, m, H–Ar), 7.08 (1H, s, OH), 9.22 (1H, s, NH), 9.38 (1H, s, NH); 13C NMR (125 MHz, CDCl3); δC (ppm) = 18.3, 51.3, 54.1, 99.5, 113.4, 114.6, 117.2, 129.8, 146.5, 148.9, 152.8. 157.8, 166.3. In this work, Fe3O4@PVA-SO3H magnetic nanocatalyst was synthesized after two steps under mild conditions. As it is illustrated in Scheme 1, according to the co-precipitation method, the Fe3O4@PVA nanoparticles were synthesized under N2 and in presence of PVA, solution of FeCl3.6H2O and FeCl2.4H2O. Then, in order to achieve Fe3O4@PVA-SO3H nanocatalyst, Fe3O4@PVA was reacted by chlorosulfonic acid and analyzed by several methods. At final, the nanocomposite successfully applied as an effective catalyst in the synthesis of DHPM derivatives. To study the interactions of PVA film and Fe3O4 nanoparticles, FT-IR analysis may consider one of the best tools. As can be seen in Fig. 1, the broad band in 3015–3529 cm−1 obviously stems from the vibration of OH, hydrogen bonds of OH groups in PVA and absorbed moisture. Another strong band in 2908–2920 cm−1 also indicates that there is an asymmetric stretch vibration in C–H groups. Moreover, the peaks on 1443–1460 cm−1 and 1500–1250 cm−1, respectively refer to the C–H bending of CH2 and the tensile vibration of C=O or C–O–C in the PVA spine. In other words, Fe3O4 nanoparticles may interact with PVA via hydroxyl groups present on their surfaces. On the other hand, the presence of iron oxide in the hydrogel is aligned by the absorption bands in 480–500 cm−1. 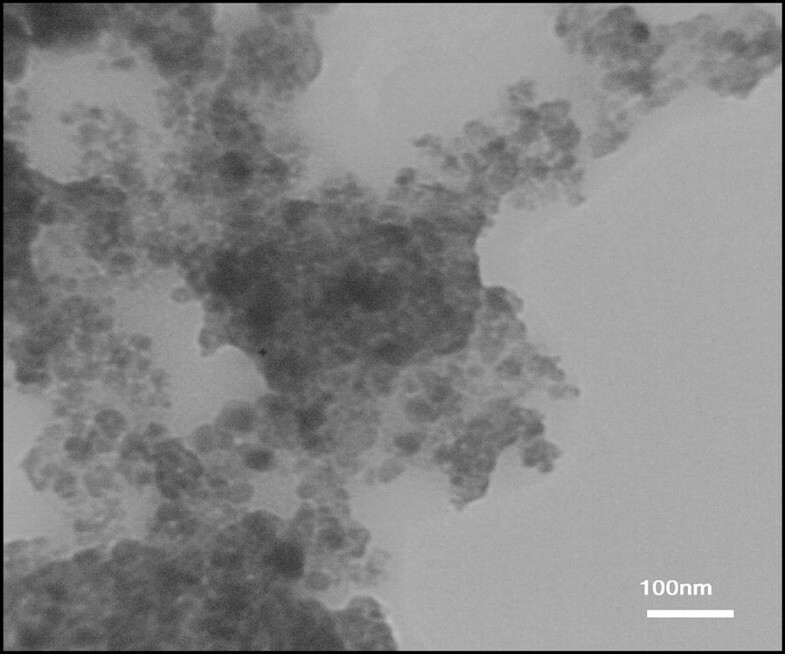 Thus, the peaks in 400–600 cm−1 may demonstrate the deformation of the iron oxide structure and the OH groups on the surface of the Fe3O4 nanoparticles. The vibration band of Fe–O–C bond in 1000–1100 cm−1 also confirms the interactions between PVA and Fe3O4 nanoparticles. EDX analysis (Fig. 2a) was included to investigate the polymer film and the well-sulfonated process in Fe3O4 nanoparticles. In this way, although the exact ratio of Fe2 +/Fe3 + might not be obtained through the EDX analysis, there are two groups of peaks who may have the significant information. First, the peaks in 0.75, 6.5 and 7.1 possibly characterize the presence of Fe atoms and second, the peaks in 0.5, 0.25, represent the O and C elements in PVA. Briefly, not only do these peaks lucidly show that the sample mainly includes PVA, Fe3O4 and SO3H, but also there is not any kind of impurity according to the EDX chart. Figure 2b confirmed that there is no considerable difference between the values ​​of the elements in primary catalyst and recycled catalyst. As a matter of fact, the elaborations related to the morphology and size of the nanocatalyst must be also explored. Therefore, we adopt SEM to investigate the morphology of the pure PVA and prepared nanocomposite. As it is shown in Fig. 3, the roughness may refer to the presence of Fe3O4 particles amongst the PVA matrix. Furthermore, not only is there not any Fe3O4 aggregation, but also the nanocomposite particles are distributed uniformly in an average size of 47 nm. It is worth noting that the Fe3O4 particles have the nearly spherical shape and are part of the Fe3O4@PVA-SO3H nanocomposite film. On the other hand, because there is an appreciable adhesion between organic (PVA) and inorganic (Fe3O4) phase, the distance between the nanoparticles is much larger than diameter of them. To lend further support the morphology of the synthesized catalyst, we also include the TEM images in our study. In Fig. 4, the magnetic nanoparticles are shown by dark spots. Some of them who are marked more solid seem to be severely agglomerated. However, most they are not. In contrast, polyvinyl alcohol might be recognized by transparent color in the TEM images. Amazingly, the spherical magnetic nanoparticles who are homogenously distributed prove that polyvinyl alcohol successfully prevent of coagulation. The thermal behaviour of the prepared Fe3O4@PVA-SO3H magnetic nanocomposite film was investigated by thermo gravimetric analysis (TGA) over the temperature range of 20–800 °C under air atmosphere. 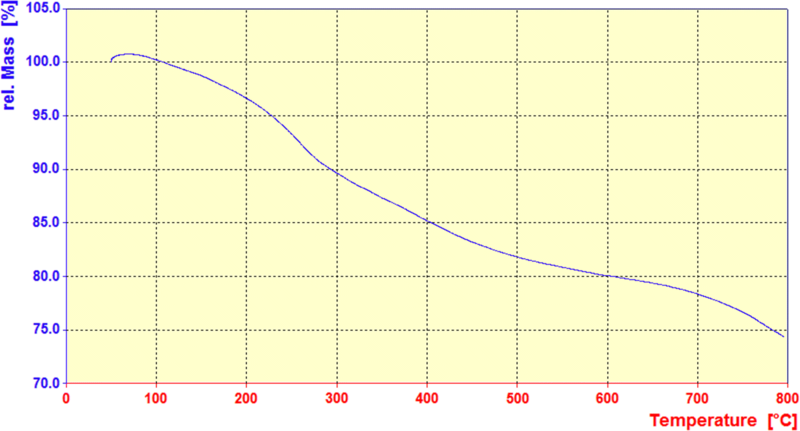 According to the TG curve of MGCS in Fig. 5, the first weight loss (from 50 to 150 °C) denotes the evaporation of adsorbed water in the sample. The second weight loss (from 200 to 550 °C) occurs when the PVA and SO3H groups are decomposed. And, up to 270 °C, there is not any weight loss in the nanocomposite (it is stable at least until 250 °C). In conclusion, this synthesized film is suitable for organic reactions outright because it has a higher thermal stability in comparison with PVA. XRD may be opted by any scientist who would like to study the crystallographic structure of the nanocomposites. In fact, the structure and phase are be able to qualitatively recognize, if one study angles and relative intensity of the peaks within the XRD analysis. Amorphous materials are definitely without peaks. However, crystalline ones who are established organized structure show specific angles in XRD. The XRD pattern of the Fe3O4@PVA-SO3H nanocomposite is shown in Fig. 6 and the average size of the particles is calculated by the Scherrer equation; D = kλ/β cosθ. According to the figure, there is a large reflection at 2θ = 19.4° for the PVA film. However, based on the Fig. 6, the diffraction peaks at the dispersion angle (2θ) are 30.39, 35.81, 37.46, 54.01, 57.58, 63.25, 66.51, 74.86 and 75.88. So, there are strong correlations between the pattern and standard JCPDS Card No. (01-075-0449) and the decrease in the intensity of the pixels fairly declines the interaction between poly(vinyl) alkyl and iron oxide nanoparticles (the crystallization). VSM analysis was applied at room temperature to measure magnetic properties. M and H curves are illustrated in Fig. 7 for Fe3O4@PVA and Fe3O4@PVA-SO3H composite nanoparticles, respectively. Both of them show a phenomenal paramagnetic behaviour without any obstruction or inclination. In fact, in the range of applied field with intensity of 10 kOe, for both the maximum magnetic saturation (Ms) is 32.95 emu/g and 24.15 emu/g, respectively. The amount of saturation absorption may be attributed to the SO3H which is coated on the nanocomposite and eliminates the accumulation and formation of the large clusters. 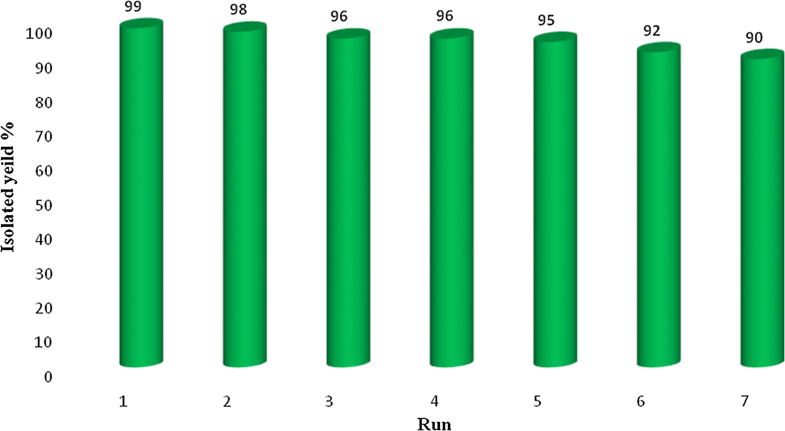 This results in the decrease in the size of the crystal and the amount of Ms. The N2 adsorption/desorption isotherm of Fe3O4@PVA@SO3H composite is shown in Fig. 8, which displays a typical type IV curve, indicating the presence of mesoporous structure. The BET surface area, BJH pore volume and pore size is 54.052 m2/g, 0.042 cm3/g, and 3.48 nm, respectively. These results confirms relatively suitable specific surface area maintenance within the nanocomposite preparation and functionalization of MNPs. Acidity ([H+]) of the synthesized Fe3O4@PVA-SO3H nanocatalyst was explored by the back titration method. At first, 0.5 g of Fe3O4@PVA-SO3H, 0.5 g of NaCl, and 10 mL of NaOH 0.1 M were added to 35 mL of distilled water and stirred with a magnet for 24 h. After that, a few drops of phenolphthalein were supplemented into the mixture and the colour changed to pink. Finally, the mixture was titrated by the solution of HCl 0.1 M to reach the neutral pH. Accordingly, the pH of the nanocatalyst was calculated 1.61. In order to look into the catalytic activity of the nanocatalyst, we apply a one-pot synthesis of DHPMs derivatives. At first, the reaction conditions is optimized through the condensation of 1.5 mmol of ethyl acetoacetate 1, 1.5 mmol of benzaldehyde 2 and 2 mmol of urea 3 in the presence of different catalytic amounts of Fe3O4@PVA-SO3H in EtOH and under reflux conditions. Table 1 represents that 0.01 g of catalyst was enough to catalyze the reactions produce high yields of DHPMs derivatives. On the other side, the efficiency and the yield of the reaction model in EtOH were meaningfully higher than those in other solvents and in short reaction times (Table 2). Furthermore, we made a considerable comparison between our catalysts and several others who were previously reported and widely adopted to synthesize DHPMs derivatives. Table 3 greatly summarizes them and proposes that our work is hugely in favor of the saving energy, high yields of the products and the reusability of the nanocatalyst. It should be add that our strategy is be able to powerfully apply to a very wide range of synthesises. For instance, a broad range of aromatic aldehydes possessing electron-withdrawing and electron-releasing substitutions, were employed and as a result a different array of products were synthesized in an appropriate time. Table 4 contains all the aromatic aldehydes supplied the desired products with high-to-excellent yields and in short reaction times. Scheme 2 suggests a mechanism for the synthesis of DHPMs derivatives. Initially, intermediate I is formed by reaction of the aldehyde with urea or thiourea in the presence of Fe3O4@PVA-SO3H. Subsequently, the addition of the ß-ketoester is followed by cyclization and dehydration, and finally dihydropyrimidinone is synthesized. The reusability perhaps is one of the most substantial advantages the catalysts may have and it play the key role in commercial applications. For that matter, the reusability of Fe3O4@PVA-SO3H nanocatalyst was also studied in the reaction model. In this way, after completion of the reaction, the nanocatalyst were separated by an external magnet, washed with ethanol, dried and lastly reused in subsequent reactions. Surprisingly, the nanocatalyst could be reused at least six times without any appreciable loss of the yields in products (Fig. 9). In summary, we have introduced Fe3O4@PVA-SO3H nanocomposite film prepared by a facile one-step in situ green precipitation method. 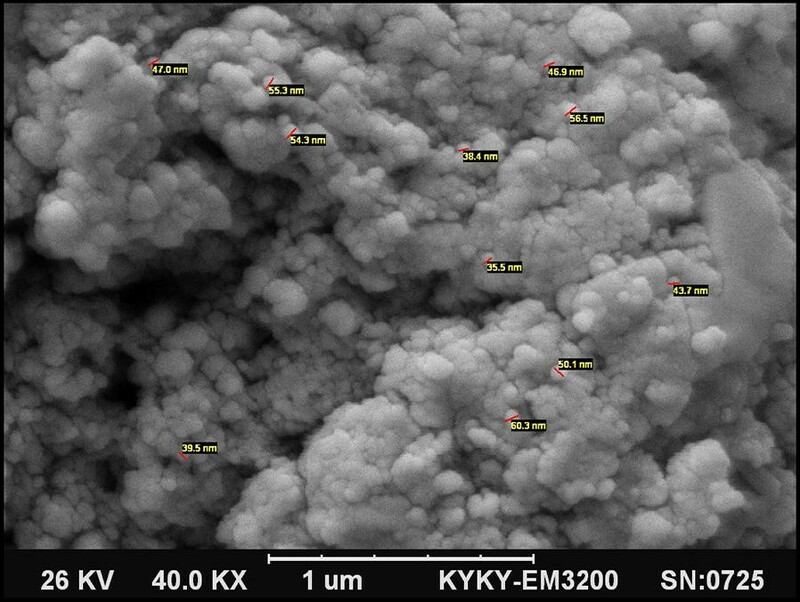 FT-IR, EDX, VSM, TGA, XRD, SEM and TEM were applied to confirm the formation of nanocomposite. 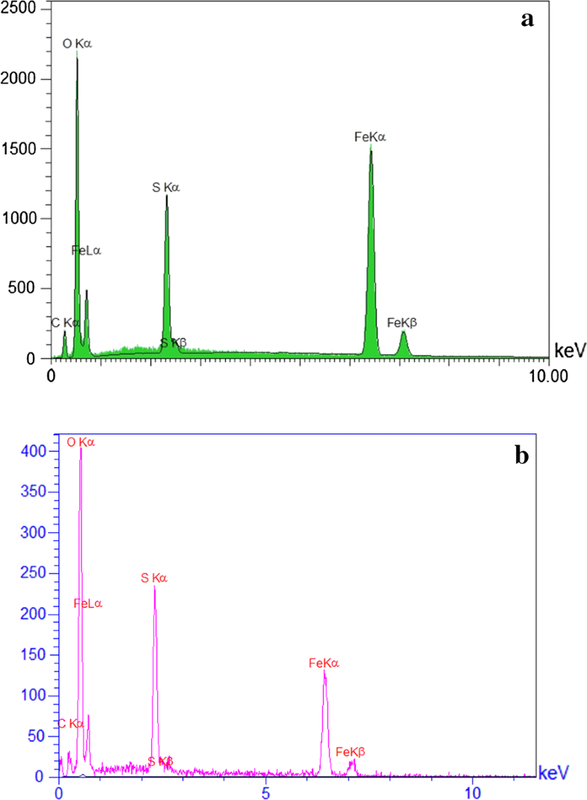 FT-IR spectrum confirmed the presence of Fe–O of Fe3O4, PVA hydroxyl and S=O bonds of sulfonated groups, indicating the formation of the nanocomposite. EDX analysis showed the presence of C, S, O and Fe elements. In XRD pattern, the expected peaks were observed in accordance with standard cards of Fe3O4 MNPs and PVA film. TEM images indicated the uniform dispersion of nanoparticles in the PVA polymer matrix, as well as polyvinyl alcohol prevented the agglomeration of MNPs. It has been proven by SEM images that spherical Fe3O4 particles are distributed uniformly in a medium size of 47 nm in the PVA films. The VSM curve shows that with the sulfonation of the Fe3O4@PVA nanocatalyst, only 8.8 emu/g of magnetic property has been reduced, which indicates the presence of functional groups in the nanocomposite. TGA results exhibited that the nanocomposite was stable at least until 250 °C without considerable mass loss. The BET-BJH showed reasonable data for surface area, pore volume and pore size of 54.052 m2/g, 0.042 cm3/g and 3.48 nm, respectively. This magnetic nanocomposite film was applied as a catalyst for the synthesis of DHPM derivatives. The catalyst can be easily separated by an external magnet and recycled for six times without any appreciable loss of activity. Some of the advantageous of the present protocol are reusability of the catalyst high-to-excellent yields, mild reaction conditions and easy work up procedure. Furthermore, FT-IR, 1H and 13C NMR analyses were performed for the confirmation of the synthesized organic products, DHPMs. Finally, this is the first report on design, synthesis, functionalization and characterization of the present nanocomposite film and performance as a heterogeneous catalyst in organic reactions. AM have designed the study, participated in discussing results and revised the manuscript. MN, JR and ZH have designed, carried out the literature study, performed the assay, conducted the optimization, purification of compounds and prepared the manuscript. Furthermore, performed the related analyses. All authors read and approved the final manuscript. The authors gratefully acknowledge the partial support from the Research Council of the Iran University of Science and Technology. Additional supporting information including spectroscopic characterization data of 1H and 13C NMR of the some products are reported in Additional file 1. 13065_2019_538_MOESM1_ESM.pdf Additional file 1. Supporting information.